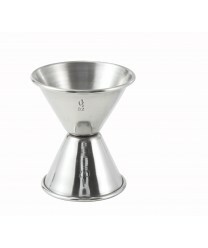 Winco J-4 Stainless Steel Jigger, 1 oz. x 1-1/2 oz. The Winco J-4 Stainless Steel Jigger, 1 oz. x 1-1/2 oz. is designed for bartenders who value accuracy. Each of these stainless steel jiggers has two sides with different capacities, so you can measure out precisely the amount of liquor you need. For your customers, that means great tasting drinks. For you, it means less waste. The two sides of the jigger are clearly labeled to prevent confusion. Winco PT-8 Stainless Steel Winco Pastry Tong, 7-1/2"
Winco MCP-30 Stainless Steel Malt Cup, 30 oz.